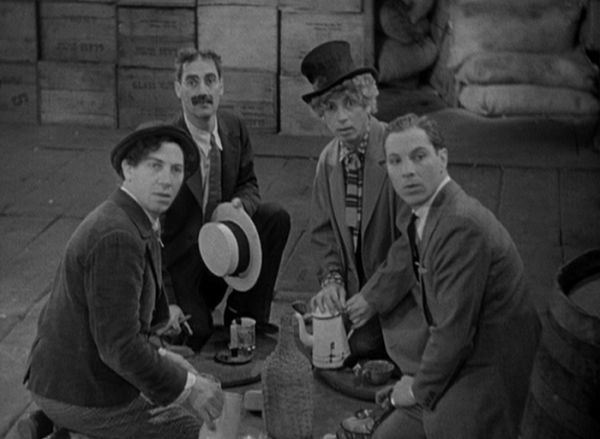 The year was 1931 and the four Marx Brothers (Groucho, Harpo, Chico and Zeppo) had by now had three hit Broadway shows and two smash movies: The Cocoanuts (1929) and Animal Crackers (1930)- behind them. Both The Cocoanuts and Animal Crackers were simply filmed versions of their Broadway shows. Both films had been shot in nearby Astoria Studios in Long Island, New York. The Marxes, now being official 24-karat movie stars, decided to pull up stakes and move to the only residence befitting motion picture celebrities- Hollywood. Their third film would be their first with an official Hollywood screenplay. What little plot there is involves the boys stowing away on a ship, being pursued by the captain of the ship and his underlings, meeting rival gangsters on board and getting involved with them, leaving the ship and thwarting an attempted kidnapping of one of the gangster’s daughters. Monkey Business, like every Marx Brothers film, has several delightful musical numbers. 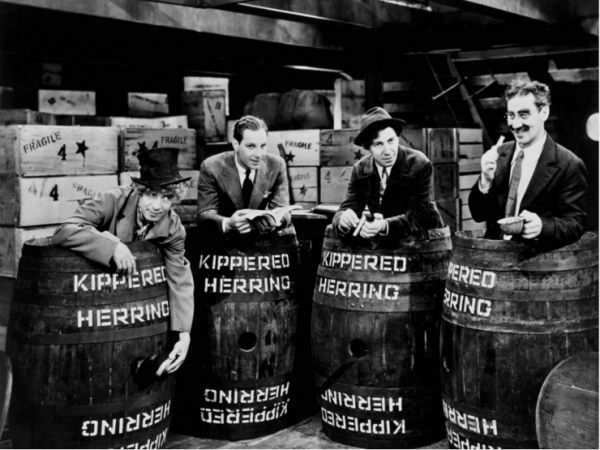 The movie opens with the four brothers, hiding out in four barrels, beneath the deck, singing “Sweet Adeline.” To this day, a Marx Brothers rumor exists which states that mute Harpo is actually singing the song, hidden from sight inside his barrel, along with his three speaking brothers. Neither Harpo himself, nor any of his brothers, ever acknowledged whether or not the perennially silent sibling did, indeed, harmonize, while within his barrel in this scene. Whether true or not that Harpo was stealthily singing, we must be resigned to the fact that Harpo (and presumably his brothers) each went to his grave with the secret intact and unrevealed. Another interesting Monkey Business first, we see Groucho strumming (albeit just a few comical notes) his musical instrument of choice, the guitar. 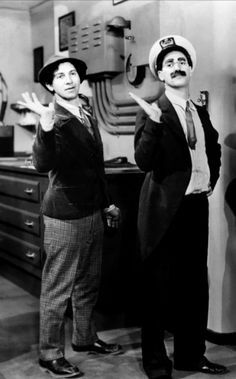 Few but Marx Brothers aficionados are aware of the fact that Groucho was actually a very fine and devoted guitar player in his real life, much as Harpo and Chico were on their harp and piano, respectively. 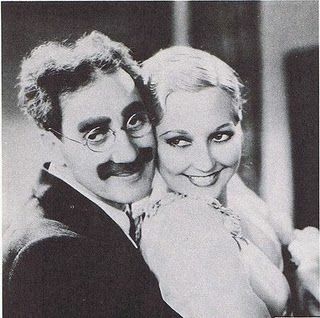 Groucho was to accompany himself while he, again, teamed with Thelma Todd in a scene in the boys’ follow-up film Horse Feathers the next year. After these two brief guitar excursions, nothing more was ever heard in a Marx Brothers film of Groucho and his instrument of choice. On December 16, 1935, Thelma Todd’s dead body was discovered in a car in her garage- the cause of death was carbon monoxide poisoning. Thelma’s death has been one of Hollywood’s great unsolved mysteries for the past eight decades- arguments persist to this day as to whether her demise was a suicide, an accident or murder. Sam “Frenchie” Marx, the father of the boys, made his motion picture debut, as an extra, in <>Monkey Business. In the scene on the pier, after the ship has docked, we catch a brief glimpse of a smiling Frenchie, sitting on a crate, amongst the waving crowd- in reality undoubtedly proud of his four famous sons. Like many Marx Brothers films, several Monkey Business lines had to be changed (i.e. censored) because of sexual innuendo. 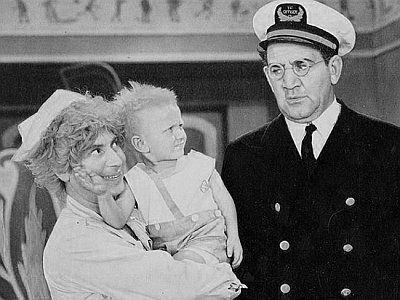 Also missing from the film’s final version is a scene (captured for posterity only in production stills) of Harpo, dressed as a nurse, holding a baby Billy Barty in his arms. We can only imagine how funny this scene must have been. Monkey Business premiered on September 19, 1931. It was not only a bonanza at the box office, but also garnered unanimous happy and pleased reviews. A follow-up Marx Brothers film to Monkey Business, continuing with the gangster main theme, was originally planned. Sadly and unfortunately, famed aviator Charles Lindbergh’s baby son was kidnapped and murdered, ostensibly by gangsters, and the idea was dropped like a hot potato. Monkey Business was banned in some countries because censors feared it would encourage anarchic tendencies. The American Film Institute placed Monkey Business at number 73 on its list of the funniest movies of all-time (AFI’s 100 years…..100 laughs). Monkey Business gives us perhaps our first real glimpse of vintage Marx Brothers- the four madcap zanies at their cinematic peak- wisecracking, punning, running around, leering, flirting, singing, playing and chasing blondes. Even the ever-wooden Zeppo gets a great gag in this film. As so often happened, Zeppo has to carry the film’s obligatory romantic interest, this time with gangster Joe Helton’s daughter, played by Ruth Hall. In his big scene, Zeppo tries to pick up on Ruth, who coquettishly flirts. Zeppo earnestly and romantically proclaims to her- “I’ll never leave you, before he immediately bolts off, being chased around the ship’s decks by the authorities. All four brothers give wonderful, memorable performances in Monkey Business. Both The Cocoanuts and Animal Crackers are wonderful and very amusing movies, but the prehistoric filming techniques of the time slightly diminish them for modern viewers. With Monkey Business we really capture the four Marx Brothers, on film, in all their glory. And that is some glory indeed.